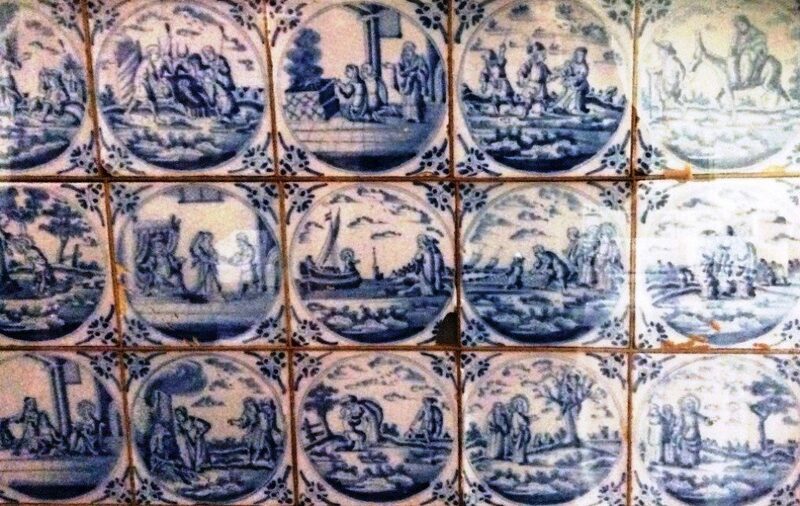 Dutch Tiles (Delft 1650) at the back of the church were presented by the late Mr Arnold Cann, who removed them from a house in West St, where they had been reused to line pantry. Some are of familiar Dutch water scenes (windmills, watermills, sluices, schoots and swans), but others depict scenes from the Old and New Testaments Adam and Eve being driven from the Garden of Eden, The Sacrifice of Isaac, The Flood, Noah and the Ark, Moses in the Bullrushes, the Dividing of the Water as well as many scenes from the Nativity, the Parables, the Gospels and the Acts. 1: Norman Font (12-13th c.) is the oldest link with the first chapel and can be found in the baptistry in the north aisle by the Lady Chapel. It is of grey Purbeck marble with simple ‘flat-iron’ recessed arcading round the octagonal bowl. This type of font was mass produced at the quarry and there are quite a number still in use in the surrounding districts. It was retrieved from the churchyard in 1876 and reinstated in the church. This may have been used for the baptism of Christopher Newport. 2: Victorian Font is now in the south aisle, having been removed from the central gangway a few years ago. It was presented by Mrs Charlotte Cox (of the banking family) in 1873 in remembrance of her three beloved children. The basin is of Caen stone supported on five columns, four of which are polished Devonshire marble. 3: Terracotta Font, which stands beneath the pulpit, is now used as a flower holder. It was for some years in St Nicholas Church Hall, Bathside, and its origin is unknown, although it has been suggested that it could have been installed when the new church was built as the design was sympathetic. It was replaced by the Cox font. Pulpit was dedicated by the Bishop of Colchester in 1897 and replaced an earlier one. It is said to be the only permanent memorial in Harwich of the 60 years reign of Queen Victoria. Chancel is polygonal with one tier of windows. The stained glass is original showing the crests of: Left – John Hopkins, 16 times mayor of Harwich whose memorial stone is on the north of the Chancel Centre – Dr Rowley, Bishop of London, who consecrated the church in 1822 Right – The Borough Arms. Altarpiece is a painting of ‘Moses Giving the Law’ and was acquired for the old church in 1700. The church-wardens commissioned it from William Paris and their account reads: “Paid Mr William Paris for the painting of the altarpiece £20, lettering the tables in ditto £6.6.0d, frame £12.12.0d, case and bringing down £1.2s Total £40”. The figure of Aaron is obviously derived from ‘The Worship of the Golden Calf’ painted by Nicholas Poussin, the famous French artist in 1636. It is interesting to note that 41 years after Harwich acquired its altarpiece, the original was sold to the National Gallery by Samuel Paris, possibly the son of William. The painting was restored in 1992. The altar frontals were embroidered by the late Gwen Stooke. Set high in the chancel walls and needing field glasses to read them, are many interesting monuments from the old church, and round the walls are many memorials to the ship-wrecked mariners and the men of Trinity House.